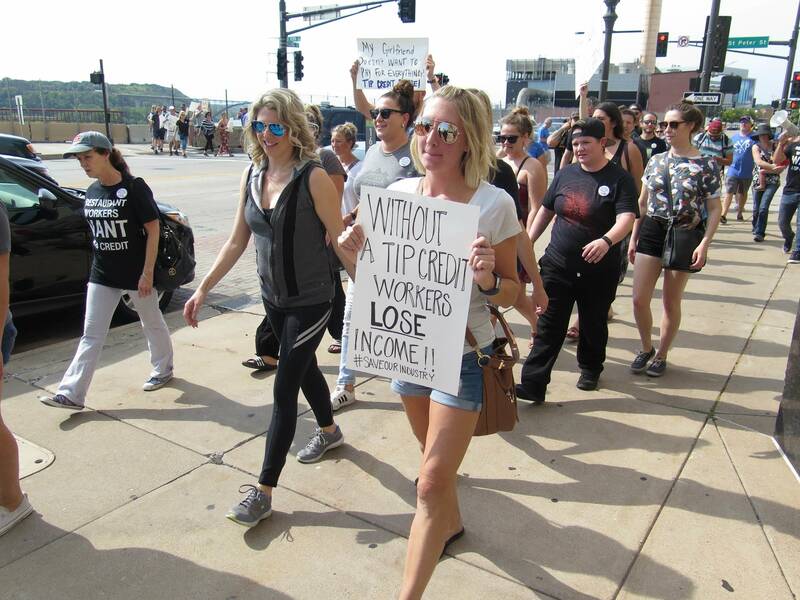 Restaurant workers marched to a rally in front of St. Paul City Hall on Monday, Sept. 17, 2018, calling for the city to include a tip credit in an expected municipal minimum wage hike. Tim Nelson | MPR News. 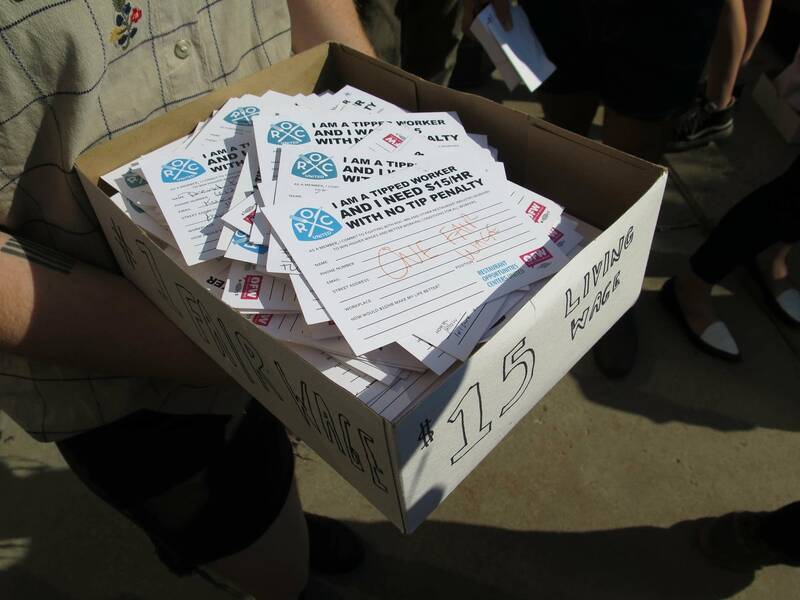 About 100 people marched through downtown St. Paul on Monday afternoon urging city leaders to carefully consider what goes into a $15-an-hour wage initiative, many of them restaurant servers who say a proposed wage ordinance should include an exemption for people that work for tips. "An income in the minimum wage without a tip credit will mean less jobs, workers replaced with iPads, family-owned local businesses disappearing from St. Paul and tips replaced with service fees," said Eagle Street Grill bartender Jeffrey Crandall. "Nobody wants that. No." Crandall and others say the city should allow employers to count tips toward hourly wages if it enacts a new minimum wage. That's one of the options included, at least temporarily, among the recommendations in a report issued earlier this month by the St. Paul-based Citizens League. Other options are so-called "one wage" alternatives that would cover both tipped and non-tipped employees, phased in over a varying number of years. A similar debate played out in Minneapolis, where the City Council ultimately decided against counting tips, arguing it was the fairest option. Supporters of that idea were also at St. Paul City Hall on Monday, saying tips are too inconsistent, too subjective to scheduling and other workplace factors, and subject to gender and other inequities. "We're in an incredibly prosperous time, and to talk about take-backs is ridiculous," said Desiree King, who says she's been a server in St. Paul for decades. A straight $15 hourly wage, she says, "is what our industry needs to survive and thrive." King said an across-the-board wage increase will keep restaurant jobs competitive and assure that diners will keep eating out at full-service establishments. 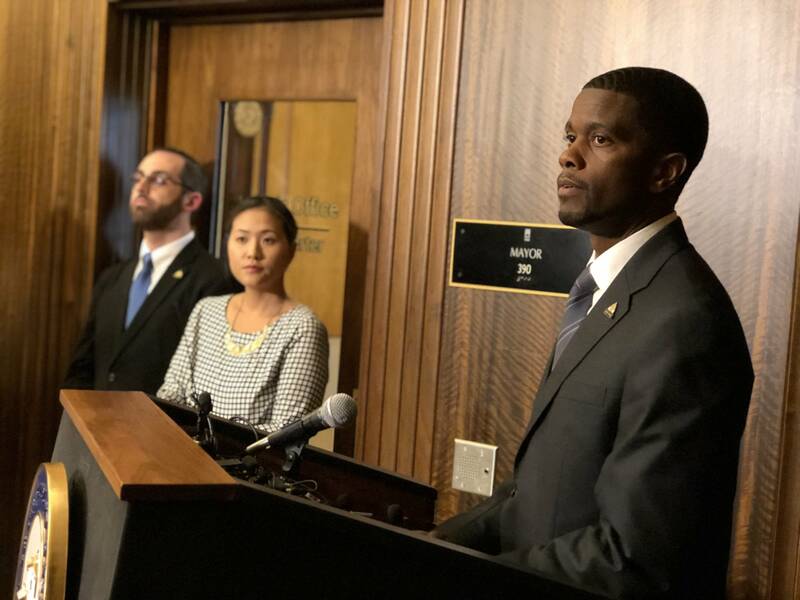 But with the St. Paul City Council poised to act on a minimum wage proposal this fall, and mayor Melvin Carter already speaking publicly against factoring in tips in any city wage ordinance, supporters of the so-called tip credit are pushing back hard. Participants at Monday's rally voiced a variety of concerns, including that diners would cut back on tips because of the wage hike. Michaelann Gillis, a server a Smack Shack in Minneapolis, said minimum wage increases there already have her worried about the traffic at her restaurant. "If they spend too much on labor, then the quality of food can suffer. But since my restaurant refuses to allow the quality of food to suffer, the quality of service to suffer, then they have to implement other options, like raising prices, and our guests are already noticing," she said. Others worry that dining establishments might eliminate tipping altogether and institute service fees to fund the wage hikes if tipped staff isn't exempted — redirecting the money to employers, rather than employees. Lori Luchsinger, a server at W.A. Frost in St. Paul, said a one-size-fits-all wage will only cut into what well-tipped staff bring home. "I don't believe, after 42 years of service, that I should be demoted to an entry level wage," she said. Both sides say the others are hiding their real agendas — that supporters of a tip credit are just the unwitting pawns of greedy business owners who don't want to pay, or that across-the-board wage increases are just a false pretext for labor unions looking trying to make inroads into the service sector. City council president Amy Brendmoen says the council understands the gravity of the debate and says the lengthy discussion about the matter shows St. Paul isn't simply going to copy-and-paste from the example in Minneapolis. "I don't think anything should be a foregone conclusion for us at this point," Brendmoen said. Mayor Carter said he wants a new wage ordinance by the new year.